She’s working on building those little muscles. In this picture she was propped up on a pillow but she’s decided to try some crunches off of it. She cracks me up. 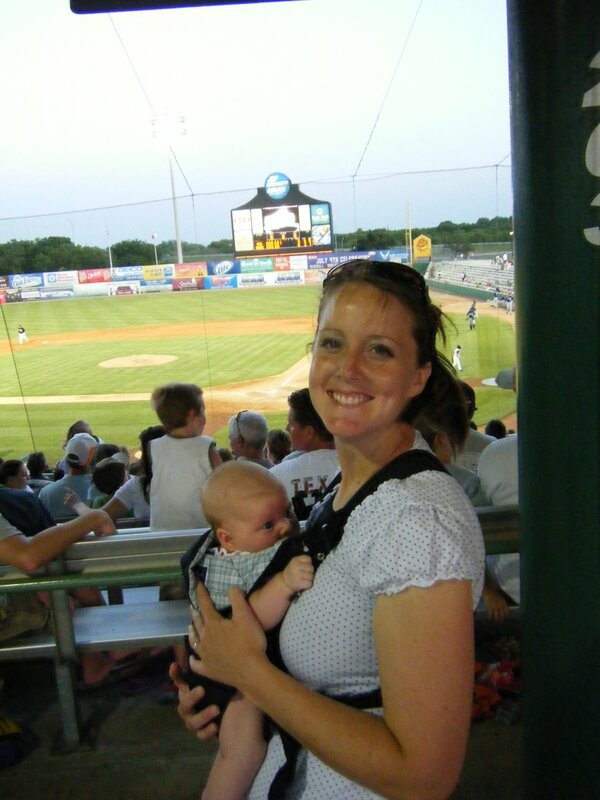 And speaking of games, we took her to her first baseball game this week. She wasn’t impressed. It was extremely windy and I think that bothered her more than a dislike for the game. We spent quite a few innings in the car but we were in the park for one or two and I’m not sure I watched an at bat in it’s entirety. It made me appreciate all those baseball games my parents took us girls too…it occured to me that they probably didn’t get to watch the game as much as they would’ve liked to and it was probably a whole lot of work to get us there and keep us happy…thanks Mom and Dad :). And finally, here she is talking. She’s taken to conversing quite a bit these days. I wish I knew what she was saying because she tells quite the story. She does these really high-pitched inflections that make me laugh every time. I’m amazed at how she can change her pitch to sound happy or sad. 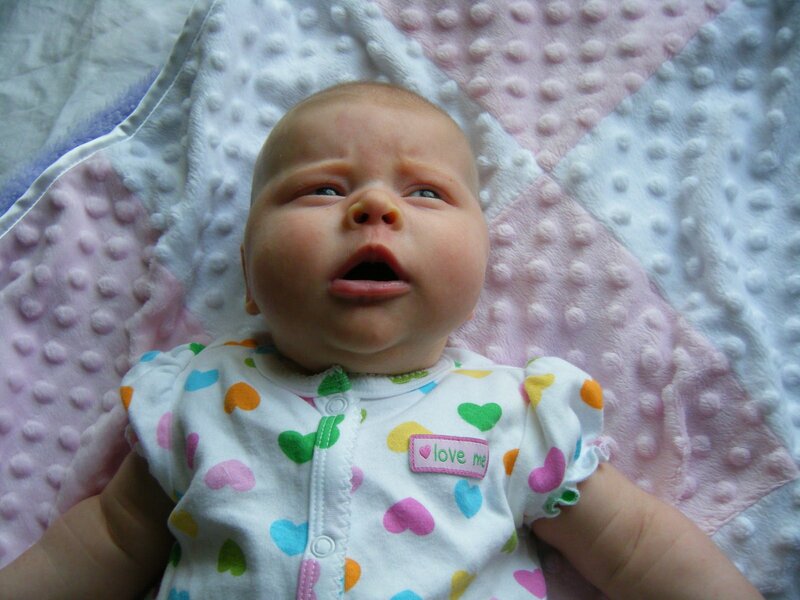 This is what she looks like when she’s on a roll…very expressive :). That cute little chubberoo! Her little personality sounds like it's really beginning to present itself. I'm sure she really did want to bat that monkey! I can't wait to see her before long. As for watching baseball, I saw enough to keep me happy when we took all of you to the games, it was probably more fun just sharing a place we loved with you than the baseball itself. oh.my.goodness. you guys need to get here sooner or i need to come there sooner! 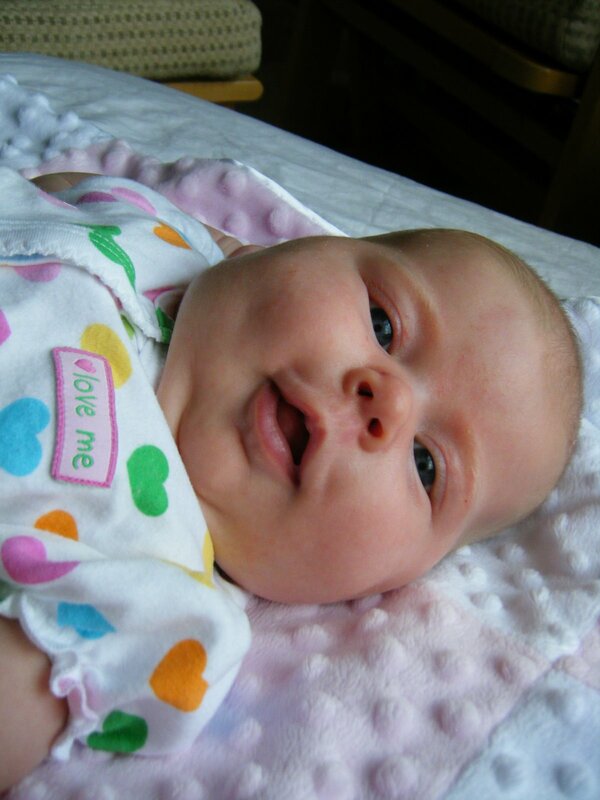 She is soooo adorable…and I dar say those cheeks are bigger than Evie's now. I love that crunches picture, it cracked me up…also the new picture on your sidebar, it's so adorable. Actually, I really liked all the pictures. 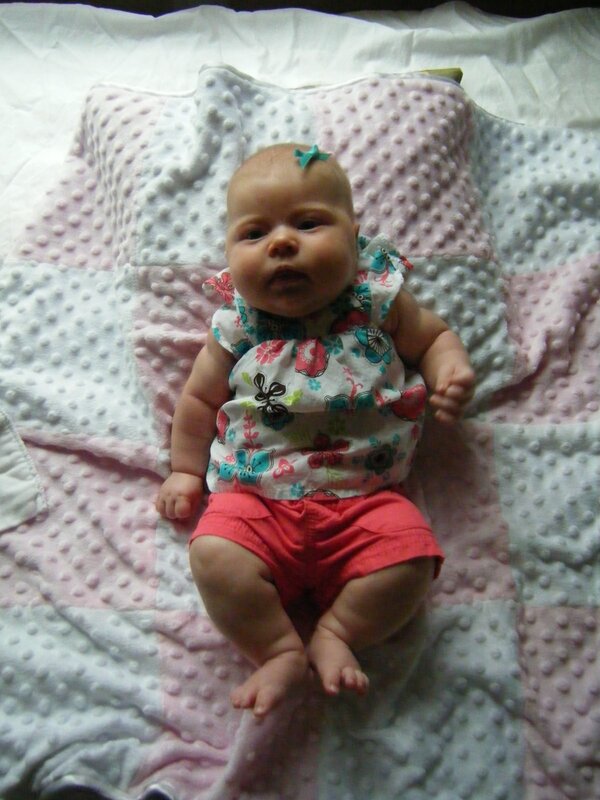 Oh my word…I just want to give her squeezes and smooches! I can't wait for her and Evie and Lydia to all be together at the same time!! Ahh! Oh my goodness she has grown so much!!! Look at those chubby cheeks- I love it!!! I loved the video- she's so cute! Ahh! I love seeing the pictures of baby J! You look like such a cute mommy!!! I must say ditto to all that has already been commented. Lydia has the same polka dot outfit Jess is wearing in the first picture, and when I saw that first picture it kind of looked like Lydia for a second. I guess they're related! Only a month until you get here!! What a sweet lovable baby! Grandpa and I are like the rest of the family, we can hardly wait for you to arrive. The month of June has flown by and we are sure that July will as well. We have a VHS of TM starting to explore a little thing like that matt, only it was Sesame Street characters. It is fun to watch them change each day as they do different things. She is precious!! congratulations on the cute little rug rat. She has cute little cheeks and nice chunky thighs. I really wish we could have come to that baseball game with you!!! I love all those pictures. Ha ha… are those cheeks for real?! What are you feeding that kid… steak? Lindsay you look amazing! You guys are a fun family. What a precious little baby. So jealous Cathy already got to meet her in person. Loved the baby announcement! Looks like everyone is happy and healthy! Keep those pics acoming! Well, I hope you get this because I am wishing you a great birthday today, Lindsay. I hope you have an extra wonderful day, and I just bet everyday seems special now that Jessica is here. Happy, happy birthday! Ok…I know you'll be here in week and a half and all, but I still need to see some more pictures before then! LOVE you!